A4 Compendiums There are 13 products. 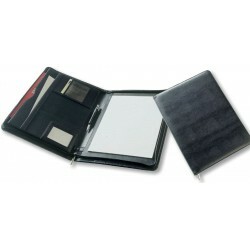 A4 zippered compendium made from microfiber with coloured PU trim.Includes internal and zippered pocked, pen loop, business card holder and id pocket. 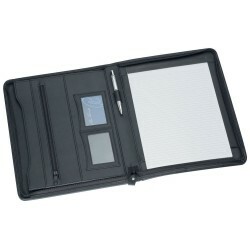 Metal zip pullers and 25 page lined pad which inserts from the top. Pen not included. Large P.U. 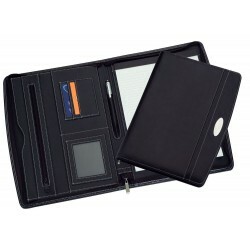 portfolio with a secure zip around closure, a large internal document folder, a lined A4 pad, pockets for business cards and a pen loop. Laser engraves to a matt Brown finish. 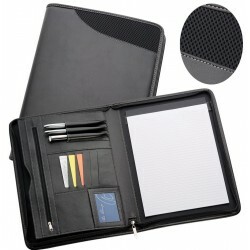 Stylish and made from PU imitation leather with mesh trim.Zippered compendium with internal and zippered pockets, 3 pen loops, id pocket and 5 business card holders, lined pad which inserts from the top. Pens not included. 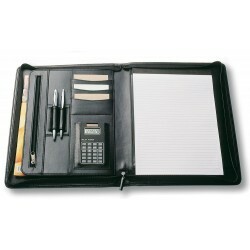 Made from soft-touch leather-look material.Features include zipper closure, pen loop, business card holders, 2 internal gusseted pockets and A4 lined pad which inserts from the top. Pen not included. Fits an iPad in the left side pocket. 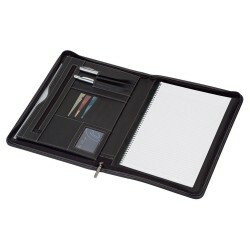 A4 size zippered compendium in Koskin leather-look material with white stitching and grey EVA material contrast panels inside.Includes internal gusseted pocket, 3 pen loops, business card holder and lined pad which inserts from the top. Pens not included. 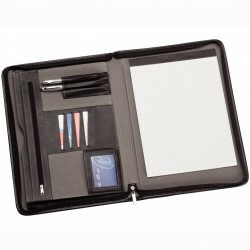 In durable Imitation Leather. 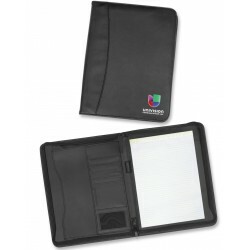 Features zippered closure, internal gusseted pocket, internal zippered pocket, business card holders, pen loop and lined pad which inserts from the top. Pen not included. Fits an iPad in the left side pocket. 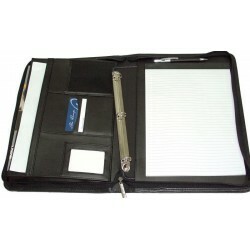 A very stylish and versatile PU compendium with silver stitchingFeatures include zipper closure, internal gusseted pocket, internal zippered pocket, 2 pen loops, business card holders and comes with a spiral lined note pad which inserts from the side. Pens not included. Fits an iPad in the 2 Left side pockets. 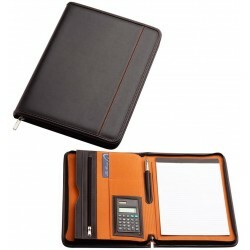 A4 size zippered compendium in black koskin leather-look material with orange stitching and orange EVA material contrast panels inside.Features include internal gusseted pocket, internal zippered pocket, solar powered calculator, pen loop, business card holder and 25 page A4 lined pad which inserts from the top. Pen not included. 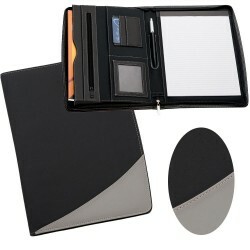 Made from koskin leather-look material with metal badge. 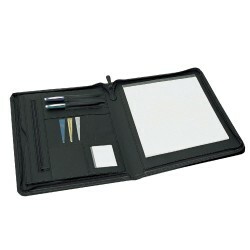 Features include zipper closure, gusseted and zippered inside pockets, 2 pen holders, business card holder and lined note pad which inserts from the top. Pens not included. Metal badge engraves champagne. Fits an iPad in the left side pocket.